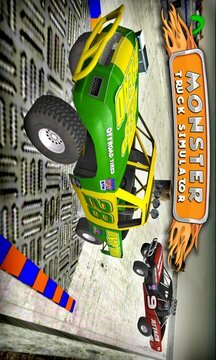 Experience the Thrill, Excitement and Adrenaline rush in this exciting 4x4 Real Extreme Monster Truck Stunt Simulator. This fun filled addictive arena for monster truck stunts over the high rise buildings and jumping will give you breath taking daring stunts and excitement when driving and simulating into 4x4 Mega Monster Extreme Real trucks. The 4x4 Monster Truck Rooftop Stunts is here to give you the thrilling adventure of simulating, driving, drift and drag racing. 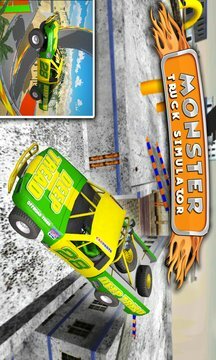 Monster Truck Stunt 3D is an action packed fun filled game suitable for all ages. Enjoy the Monster desert truck safari adventure and thrilling adventures. Speed up and take off in 4x4 crazy jeep stunt adventure in the air with the most thrilling jumps over the buildings and perform deadly roof top stunts, massive jumps, and insane obstacles, you will be able to pull off awesome tricks. Go for the giant leaps while having some extreme fun. This game is designed to give you ultimate adventure and an insane trucking experience. These 4x4 extreme monster Bigfoot SUV desert safari adventure trucks will take you into gulp of air. Driving these mega rugged trucks is a barrel of fun. This extreme crazy driving and parking experience is designed for crucial roof stunts. Perform 4x4 Monster Truck Stunts on roof tops and high rise buildings, drive the worlds most amazing SUVs, Trucks, Monster Trucks, and Jeeps all on roof top and perform wild insane stunts in roadless environment. Speed off with NO restrictions into beautiful graphics, realistic physics, and action packed excitement. A crazy but extreme realistic Offroad Driving and stunt Adventure of 2016 in driving simulator with smooth controls and 4x4 physics packs quite a ride! Get behind the steering wheel of your huge extreme real crazy monster truck and start the engine of your off-road hill climb truck racer and start simulating and driving through fun and challenging levels and cross all the hurdles and missions that comes on your way. 4x4 Monster Rooftop Stunt Jumping and Driving through the roof tops do require a huge amount of driving skills and if you think you are the truck driver that can conquer the rooftops of huge skyscrapers, Then challenge yourself to play this fun and exciting 4x4 monster truck game. Be careful driving your truck through the bumpy roads with steep hill climbs. Speed on the racetrack and take off in the air with the most thrilling jumps. This game is a treat for anyone with an adventurous spirit and an appetite for thrill. Jump between rooftops, race over raised platforms and avoid crazy traffic to complete the Stunt by Driving 4x4 huge real crazy extreme monster trucks, jeeps, SUVs, be the daredevil and master stuntman and perform Dangerous Parking mission as fast as you can. FLY your Monster Trucks and 4x4 SUVs and Jeeps in the sky! Park your Monster crazy Trucks on the rooftop of high-rise buildings. Sky is the Limit!